These product can help with plucking and/or feather destructive behaviors. Products to assist in plucking and overpreening in pet birds and parrots. This toy is great for beginner foraging, pluckers and overpreeners. 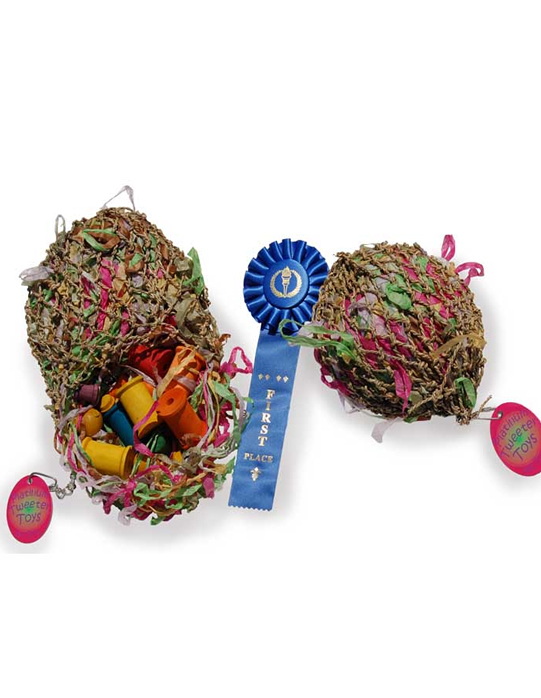 Made with Coin wrappers, Natural Vine Balls, colorful Finger Traps and topped off with Foam Pieces. Add some treats for more foraging fun! All natural coconut fiber is not only a great nesting material but it is also a great stuffing material. Comes in 8oz. pkg. Yields approximately 1 foot x 8 inches of coco fiber. are the leaves, roots, bark and flowers of the plants that animals in the wild seek as a means to obtain required nutrients, minerals, vitamins and healing capabilities. It differs from food and water additives such as vitamins and medications in the manner that it allows your birds to choose what it is they require and in what amount, when and if their diet needs supplementing. Herb Salad's 22 medicinal herbs address common health issues safely and without the dangers that improper medicating and over supplementing can produce. ThIs item is repackaged from bulk. Hatched™ Crushed Eggshell PER LB. Hatched™ Crushed 100% Pure Eggshell is a superior, completely safe way to provide your pets with the proper amount of calcium by letting the birds decide how much they need! This is like no other calcium supplement product out there! No more worrying about under or over dosing your pets with water additives. Human-grade, FDA regulated facility and packaging, crushed, not powdered� This is pure, sanitized eggshell, each batch tested and passing with a Certificate of Analysis. This is NOT ground like a powder, but is crushed into tiny pieces. contains highly concentrated broad spectrum nutrients Bee Pollen, Royal Jelly, and Bee Propolis. Avian Trio will fill any gaps in your birds diet. Avian Trio also provides your bird with essential nutrients resulting in a happy, healthy, vibrantly colored bird.